If your team didn't make a big deal in the last few weeks leading up to the trade deadline, dont fear. Since 1980, only twelve eventual Stanley Cup Champions have made deals around deadline day. Here's a list of trades provided by NHL Media Services. Since 1980, there have been a number of trades made around the trade deadline that have helped teams go on to win the Stanley Cup that season. Following is a summary of some significant transactions involving the eventual Stanley Cup champion. March 10, 1980 -- New York Islanders acquired C BUTCH GORING from Los Angeles for RW BILLY HARRIS and D DAVE LEWIS (trade completed one day before the deadline). Harris was the first player drafted in Islanders’ history and had been with the club since its inaugural season, 1972-73. Lewis had been a steady presence on the Islanders blueline for seven seasons. With Goring, the Islanders went undefeated in their last 12 regular-season games (8-0-4) and went on to capture their first-ever Stanley Cup championship. March 4, 1991 -- Pittsburgh Penguins acquired C RON FRANCIS, D GRANT JENNINGS and D ULF SAMUELSSON from Hartford for C JOHN CULLEN, RW JEFF PARKER and D ZARLEY ZALAPSKI (trade completed one day before the deadline). The Penguins went on to capture the 1991 Stanley Cup, the first championship in franchise history. Francis was tied for the team lead with four game-winning goals and tied for fifth in scoring with 17 points (7-10 --17) during the 1991 Stanley Cup Playoffs. Francis played in Pittsburgh for eight seasons, posting 100 points in 97 post-season games and was also traded at the deadline again in 2004 by Carolina. March 21, 1994 -- New York Rangers acquired (1) LW STEPHANE MATTEAU and RW BRIAN NOONAN from Chicago for RW TONY AMONTE and the rights to LW MATT OATES. (2) RW GLENN ANDERSON, the rights to D SCOTT MALONE and Toronto’s fourth-round pick in 1994 Entry Draft (D ALEXANDER KOROBOLIN) from Toronto for RW MIKE GARTNER. (3) C CRAIG MacTAVISH from Edmonton for C TODD MARCHANT. The Rangers, on their way to capturing the Presidents’ Trophy as the club with the League’s best regular-season record, acquired four players at the trade deadline and went on to win their first Stanley Cup since 1940. New arrivals Matteau, Noonan, Anderson and MacTavish all had important roles in the Rangers’ Cup triumph. March 18, 1997 -- Detroit Red Wings acquired D LARRY MURPHY from Toronto for future considerations. Murphy appeared in all 20 playoff games for Detroit, recording 11 points (two goals, nine assists) and led the League in plus-minus (+16) as the Red Wings captured their first Stanley Cup since 1955. March 14, 2000 -- New Jersey Devils acquired RW ALEXANDER MOGILNY from Vancouver for C BRENDAN MORRISON and C DENIS PEDERSON. Mogilny added to the offensive powerhouse that led the Eastern Conference in goals with 251. Although he tallied just 3-3--6 in 12 regular-season games and 4-3--7 in the playoffs, Mogilny’s presence helped free other players en route to the team’s second Stanley Cup. Morrison, meanwhile, developed into one of hockey’s top forwards with the Vancouver Canucks. February 21, 2001 -- Colorado Avalanche acquired D ROB BLAKE and C STEVE REINPRECHT from Los Angeles for RW ADAM DEADMARSH, D AARON MILLER, C JARED AULIN and Colorado's first-round picks in 2001 (LW DAVID STECKEL) and 2003 (C BRIAN BOYLE). This trade was completed 20 days before the trade deadline. Rob Blake made an immediate impact in the Avalanche's first Stanley Cup victory since 1996, leading all defensemen in playoff scoring with 19 points (6-13--19). Blake joined a team full of leadership to win his first Stanley Cup along with veteran defenseman Ray Bourque. March 10, 2003 -- (1) New Jersey Devils acquired RW GRANT MARSHALL from Columbus for a conditional choice in 2004. (2) New Jersey acquired D RICHARD SMEHLIK and a conditional choice from Atlanta for a fourth-round pick in 2003 (D MIKE VANNELLI).The Devils were relatively quiet at the 2003 trade deadline compared to 2002, when they obtained C Joe Nieuwendyk and RW Jamie Langenbrunner from Dallas for C Jason Arnott, RW Randy McKay and New Jersey's first round choice in 2002. Grant Marshall provided timely scoring for the Devils (6-2--8) including a series-clinching goal in triple overtime against Tampa Bay. March 9, 2006 -- Carolina Hurricanes acquired RW MARK RECCHI from Pittsburgh for LW NIKLAS NORDGREN, C KRYS KOLANOS and Carolina's second-round choice in 2007 (later traded to San Jose). The 38-year-old Recchi, who had won a Stanley Cup with Pittsburgh in 1991, had 16 points (7-9--16) during the 2006 Stanley Cup Playoffs, including six points in the Final against Edmonton. He scored the game-winning goal in Game 4 that put Carolina up 3-1 in the series. The Hurricanes had also added a key piece to the puzzle on Jan. 30 when they acquired Doug Weight from St. Louis (along with Erkki Rajamaki) for Jesse Boulerice, Michael Zigomanis, Magnus Kahnberg and a first-round draft choice. February 27, 2007 -- Anaheim Ducks acquired LW BRAD MAY from Colorado for G MICHAEL WALL. A veteran of 15 NHL seasons and 932 regular-season and Stanley Cup playoff games, May brought plenty of experience to the Anaheim lineup for the stretch drive. The 35-year-old Toronto native appeared in 18 of the Ducks' 21 postseason games as the franchise won its first Stanley Cup championship. February 26, 2008 -- Detroit Red Wings acquired D BRAD STUART from Los Angeles for Detroit's 2nd-round pick in the 2008 Entry Draft (later traded to Colorado) and 4th-round pick in 2009. Stuart arrived in Detroit with more than 500 games of NHL experience and quickly formed an effective blueline partnership with hard-hitting Niklas Kronwall. Stuart appeared in all 21 Red Wings' playoff games in their 2008 Stanley Cup campaign, tallying seven points (one goal, six assists). He ranked third in the NHL with a +15 rating, just behind Kronwall and Conn Smythe Trophy winner Henrik Zetterberg (+16). March 4, 2009 -- Pittsburgh Penguins acquired RW BILL GUERIN from NY Islanders for a conditional pick in the 2009 Entry Draft. The Penguins brought in a high-scoring wing for center Sidney Crosby at the trade deadline for the second consecutive season, having benefited from the acquisition of Marian Hossa a year earlier. In Guerin, the Penguins added a 17-year NHL veteran with 408 goals, 811 points and a Stanley Cup ring. He made a major contribution to the Penguins' Cup drive, recording seven goals and 15 points in the postseason. Here is the complete list of trades consummated today before the NHL Trade deadline along with the history of number of trades over the last 31 seasons courtesy of NHL Media Services. Anaheim traded C Maxim Lapierre and C MacGregor Sharp to Vancouver for C Joel Perrault and Vancouver's 3rd-round pick in the 2012 Entry Draft. Atlanta traded RW Niclas Bergfors and LW Patrick Rissmiller to Florida for RW Radek Dvorak and Carolina's 5th-round pick in the 2011 Entry Draft (previously acquired). Atlanta traded G Drew MacIntyre to Montreal for D Brett Festerling. Atlanta traded LW Fredrik Modin to Calgary for Calgary's 7th-round pick in the 2011 Entry Draft. Boston traded D Jeff Penner and RW Mikko Lehtonen to Minnesota for G Anton Khudobin. Carolina traded LW Sergei Samsonov to Florida for D Bryan Allen. Chicago traded C Ryan Potulny and a 2nd-round pick in the 2011 Entry Draft to Ottawa for D Chris Campoli and a conditional 7th-round pick in 2012. Colorado traded D Kevin Montgomery to Edmonton for D Shawn Belle. Columbus traded D Rostislav Klesla and LW Dane Byers to Phoenix for LW Scottie Upshall and D Sami Lepisto. Columbus traded LW Tom Sestito to Philadelphia for C Michael Chaput and RW Greg Moore. Edmonton traded RW Dustin Penner to Los Angeles for D Colten Teubert, Los Angeles' 1st-round pick in the 2011 Entry Draft and a conditional 3rd-round pick in 2012. Florida traded D Dennis Wideman to Washington for C Jake Hauswirth and Washington's 3rd-round pick in the 2011 Entry Draft. Florida traded LW Chris Higgins to Vancouver for D Evan Oberg and Vancouver's 3rd-round pick in the 2013 Entry Draft. New Jersey traded C Jason Arnott to Washington for C David Steckel and Washington's 2nd-round pick in the 2012 Entry Draft. St. Louis traded LW Brad Winchester to Anaheim for Anaheim's 3rd-round pick in the 2012 Entry Draft. Toronto traded C John Mitchell to NY Rangers for the Rangers' 7th-round pick in the 2012 Entry Draft. Atlanta claimed C Rob Schremp from NY Islanders. Calgary claimed D Brett Carson from Carolina. Ottawa claimed G Curtis McElhinney from Tampa Bay. Here is a replay of David Poile's post deadline press conference courtesy of Predators.com. The gist of what was said was that we have one of the best defenses in the league as well as one of the best goaltending tandems. He admitted that the Preds needed more offense. Poile also pointed out that instead of getting a veteran player this year, the team had confidence in their youngsters. The best quote of the conference was "Just because you don't get something done, doesn't mean you're not doing something." We will, of course, have any moves that the Predators may make. For completed trades TSN has their Tradecentre and complete trade list. NHL.com has their Trade Tracker. The Predators also promise updates from their own "war room" throughout the day. If you have XM Radio, NHL Home Ice 204 will have you fully covered. If you have the luxury of being at home then lock in to TSN's all day coverage on NHL Network. I didn't do a trade deadline piece here at POTG this morning since I had the opportunity for a Q & A with our friend Patric Hoffman at Kukla's Korner. Head over there at this link for my thoughts and plenty of other deadline coverage. Thanks to Patrick and Paul for the opportunity to be in on the big day at their great site. After yesterday's game, the first thing Barry Trotz said was "It was a war." That pretty much summed it up in four words. As in any war, it was actually made up of many small battles that culminated in a final victory as the sixty minute clock wore down. I have about decided that in spite of the lopsided win-loss record in favor of the Predators that the Jackets-Preds rivalry may be one of the strongest ones in the league and certainly for Nashville since the lockout. The winning goal came from none other than David Legwand, a player that has given his all for the Predators and played the last part of the game in spite of a injured foot that had to be covered in ice after his skate was removed. The two teams really do not like each other... at all. Legwand spoke of the Jackets, "That's one of our enemies over there and they played us hard." There were minor skirmishes throughout the game that intensified as the clock wore down. With ten seconds left in the game, R. J. Umberger knocked captain Shea Weber into the dasher board face first that left a bloody gash beside his right eye. The officials whistled nothing. The hit was worse than the boarding call against Weber in Dallas on Saturday and Shea took exception to the no-call. On the ensuing play, after a Predator time out with six seconds left Weber's hatred for the Jackets erupted again as he was charged with a roughing penalty as well as a cross check. The Dark Blue Jacket gives another side of the story talking about Weber's "petticoats". I hope those two never meet because they'll need more than Petticoats to clean up the blood..
Later on in the evening, Aaron Portzline indicated that the league was reviewing the end of game skirmish with a Tweet saying, "Told the NHL is reviewing actions of #Preds D Shea Weber - two x-checks, one punch on Tyutin - @ end of today's game." As Barry Trotz has said on numerous occasions, the Predators never take the easy way. So, once again, if Weber is accessed supplemental discipline and the Predators have to pluck another player from Milwaukee then it will be one more example of "the Predator Way." Here is our game story from last night with postgame video. As a supplement to yesterday's story, the Preds finished the day with 72 points and in tent place. Minnesota, Dallas and Chicago are also at 72 and are in seventh through ninth place. Yesterday's win was sweet but Jim Diamond has the great story about Blake "Boomer" Geoffrion's welcome to Nashville during warm-ups. David Boclair has his story at The City Paper with a twist about a different role for Shea Weber..
From the blog world reports come from Ryan Porth, Amanda DiPaolo, Mark Willoughby, Dirk Hoag (with his advances stats), Jeremy Gover, Predatorial, and Fang Finger Fever. Special recognition to Robby of Hockey Night in Nashville who spent his first game on Bloggers Row and in the post game locker room. Great Job! The sad stories from yesterday's game come from the Columbus Dispatch, The Dark Blue Jacket, and The Cannon. Postgame audio from the Predators comes from Jon Blum, Blake Geoffrion, David Legwand, and Shea Weber. Blue Jacket audio comes from Rick Nash, Kris Russell, Fedor Tyutin, and Coach Scott Arneil. A note from last night from the Predators indicated that practice was canceled for today. Josh Cooper spoke with David Poile about the swirling trade rumors during yesterday's game. Yesterday's no-goal call that went against Columbus is the object of questioning the NHL war room at Puck Daddy. It appeared to be a goal but I never saw a good camera angle on it. Dirk Hoag was up early with his morning links today. The last first rounder from the 2003 draft finally made his first NHL appearance. Ex Pred Hugh Jessiman hit the ice with the Florida Panthers yesterday. He had two shots in 12 shifts and 9:31 of ice time in the Panthers 2-1 loss to the Devils. A couple of early trades went down last night. The Anaheim Ducks sent David Laliberte and Steaputfan Chaput to Boston Bruins for Brian McGrattan and Sean Zimmerman. Then the Buffalo Sabres picked up Brad Boyes from St. Louis for a second rounder. Kevin Allen has his deadline day preview and reminds folks that the deadline last year that produced 31 deals involving 55 players was two days after the Olympic roster freeze was lifted. One player in numerous trade rumors appears to be staying put as Chris Phillips signed a three year deal with Ottawa. Matthew Hulsizer tells FSAZ that he Coyotes deal will close despite the recent delays. It doesn't sound like The Sporting News-Fanhouse deal went as smoothly as anticipated. Are you ready for for some "baby gaga" breast milk ice cream? The Nashville Predators won one of the most critical games of the season against the Columbus Blue Jackets 3-2 on Sunday afternoon at the Bridgestone Arena. The Predators scored all three of their goals in the third period. As the clock ticked down and the Preds were hanging on to a 3-2 lead the season could have been hanging in the balance. A loss to Columbus would have moved the Jackets past the Preds in the standings. However, with the win the Predators moved back in to the top eight in the Western Conference which could change with further action tonight. Barry Trotz said, "It was a war!" That was highly descriptive of two teams that were desperate for a win on the day before the trade deadline when teams have to decide if they are buyers or sellers and whether they are committed to the playoff race all the way to the end. The Predators scoring came from Shea Weber, Jon Blum, and David Legwand who had the game winner with 1:35 remaining. The Jackets got goals from Matt Calvert and Kris Russell. Pekka Rinne got the win in net stopping 25 of 27 Columbus shots. Mathieu Garon took the loss allowing three goals on 28 shots. 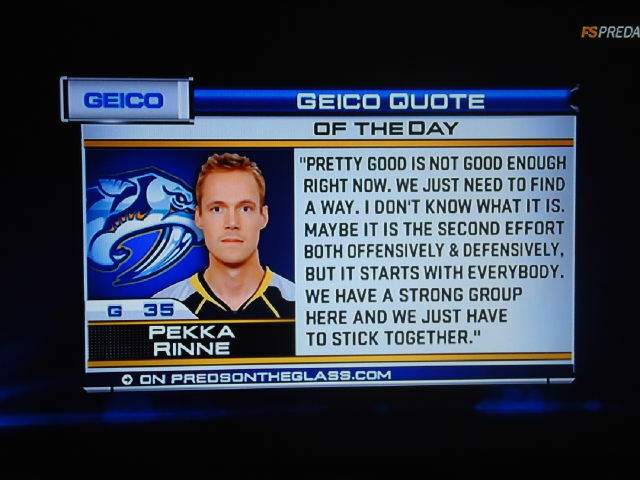 Rinne was relieved after the game, "It's about time. We've been working hard. It's been a tough go for us for sure. We play almost every second night and we've been losing so it's draining but that's the best thing. You always get a new chance and we responded. Now we can build a little bit of winning streak. It will be a big road trip for us. Big win tonight." The first period was reminiscent of so many we have seen lately. Chippiness was at a premium as you would expect between two teams that really do not like each other. There were few shots and minimal stoppages as the Predators out shot the Jackets 6-5 while Columbus led the Corsi 21-11. The middle Period was all Columbus, primarily due to a series of penalties that kept the Preds on their heels. The Predators appeared to catch a break at 12:25 when after one of the longest reviews in league history the officials gave the no-goal sign to Columbus on a shot where the puck appeared to be in the net. Shea Weber was called for hooking at 13:04 and on the resulting power play Calvert scored his second goal in a week against the Preds at 14:17 to put the Jackets ahead 1-0. For the second period, Columbus out shot Nashville 12-9 with half of their shots on the man advantage. The Corsi was even more lopsided at 25-13. The Predators came out in the third period with a determination not seen in about ten days. Weber scored at 1:47 on a shot that almost killed Jan Hejda as the slap shot appeared to bounce of Hejda's face into the Columbus net. At 7:18, Blum threaded the needle through a pack of players to score his first NHL goal and put the Preds ahead 2-1. "My first goal, especially at home, I couldn't stop smiling," said Blum. "After I scored, the fans - it was so loud and you don't see that kind type of atmosphere in the minors." Columbus came back to score on Russell's unassisted goal at 12:34 and I'm sure the Predators felt an eerie case of deja vu from some of their recent third period troubles. The hero of the game turned out to be Legwand who picked up a rebound off of a Martin Erat shot at 18:25 and flipped it into the net to put the Preds back in the lead 3-2. The win was the Predators sixteenth straight at home against Columbus. Barry Trotz was asked about the streak and gave tribute to the fans in his answer. "The teams are very close and the difference is that much (holding two fingers an inch apart). Maye it's those people out there that give us that edge. It's hard not to play hard in front of our fans. They are always great." The Predators now head out west for games in Edmonton, Vancouver, Calgary and San Jose and will not play at home again until they face Minnesota on March 10. After this road trip, the Preds play 12 of their last 15 at home. The Nashville Predators (31-23-8) host the Columbus Blue Jackets (31-23-6) today at 2 p.m. at the Bridgestone Arena. There is a lot on the line in this game. The Predators are in the midst of a four game losing streak where even the hockey gods have turned against them. After the game, they head out west for a four game road trip where three of the four games are against teams ahead of them in the standings. If the Predators' struggles continue and they lose to Columbus in regulation, they could fall to twelfth place in the Western Conference if Anaheim beats the hapless Avs later today. This is the fifth meeting between the two teams this season. The Preds lost the first meeting 2-0 on November 22 at Nationwide in a perfect outing for the Jackets. On December 1st, Steve Sullivan had the shootout winner in a 4-3 Nashville win. On January 2, the Predators took a 4-1 win in the "paint peeling" game in the only meeting of the year at Bridgestone Arena. Last Tuesday, the Predators looked horrible losing 4-0 in Columbus. The good news for the Preds is that Columbus has lost 15 in a row in Nashville. The bad news is that Columbus is hot and have gone 8-1-1 in their last ten and have not lost on the road in regulation since January 8. Columbus also has a new man in Craig Rivet who they picked up on waivers. Pekka Rinne (21-18-6, 2.16, .927) will go in net for the Preds and either Steve Mason (22-14-2, 2.97, .905) or Mathieu Garon (9-9-4, 2.60, .904) will go for Columbus. 1. Overcome bad luck by getting an early lead of two to three goals (stating the obvious). 2. Roll four lines since they basically played with three yesterday and the Jackets are well rested. 3. Play a full 60 minutes and do not collapse in the third period. Tomorrow, the Predators head out west for games in Edmonton, Vancouver, Calgary and San Jose and will not play at home until they face Minnesota on March 10. After the road trip, the Preds play 12 of their last 15 at home. After the game the Bridgestone Area will be busy with a postgame concert by Hawk Nelson and the Preds Cup Championship game between Ravenwood and Brentwood. Other Previews come from Amanda DiPaolo, Dirk Hoag, Paul McCann, Hockey Night in Nashville, The Tennessean, and Predators.com. Enemy game previews come from the Columbus Dispatch, The Dark Blue Jacket, and The Cannon. Here is our game story from yesterday's game. From the blog world reports come from Amanda DiPaolo, Mark Willoughby, Chris Burton (with his advances stats), and, Jeremy Gover. The other side of the story comes from The Dallas Morning News, ESPN Dallas, the Star-Telegram, The Dallas Stars Blog, and Defending Big D.
Dirk Hoag has a good analysis of what the Predators face with salary and players available for the trade deadline. AJ at Pull My Fang Finger has a great take off on Hunter S Thompson with Fear and Loathing in NashVegas. Wade Belak cleared waivers and is was sent to Milwaukee. He will have to fight every AHL wannabe tough guy that is wanting to make a mark and impress the big clubs. Ryan Ellis became the third OHL defenseman to rack up 300 career points. He is 30 away from the all time record held by Hall of Famer Denis Potvin. The Admirals lost in overtime to Rockford 4-3. It sounds like Anders Lindback is headed back to Nashville. Also of note, Roman Josie was injured to an unknown extent. In the Saturday Faceoff, Ryan and Patrick discuss the question of whether the trade deadline is overrated. The pressure of trade deadline appears to be getting to Nick Kypreos according to this story about his Tweet. The New York Rangers acquired Bryan McCabe from the Panthers in exchange for Tim Kennedy and a third round draft pick. This is too cool! A passenger on a commercial airliner videoed the Space Shuttle Discovery's liftoff on Thursday. The Nashville Predators sent Mark Dekanich back to Milwaukee and recalled Anders Lindback to the big club. This was expected as Lindback was sent down to play a few games after sitting for an extended period in Nashville. Both Pekka Rinne and Lindback played yesterday with Lindback's game ending much later last night so Rinne appears to be the one getting the start this afternoon against Columbus. Nashville, Tenn. (February 27, 2011) – Nashville Predators President of Hockey Operations/General Manager David Poile announced today that the club has recalled rookie goaltender Anders Lindback (AHN-dehrs LIND-bahck) from Milwaukee (AHL) and reassigned goaltender Mark Dekanich (MAHRK DEH-kuh-nihtch) to the Admirals. Lindback, 22 (5/3/88), posted a 2-2-0 record with a 2.73 goals-against average and a .915 save percentage during his one-week stay with Nashville’s primary development affiliate, his first career AHL action. The Gavle, Sweden native returns to Nashville where he has posted a 10-5-2 record, a .914 save percentage, a 2.58 goals-against average and a pair of shutouts in 2010-11, his first season in North America. Dekanich, 24 (5/10/86), did not see action in his fourth recall of the season. The 2011 AHL All-Star is third in the American League save percentage (.929), ranked fourth in goals-against average (2.04) and is tied for eighth in wins (20). The Predators close out February this afternoon when they take on the Central Division rival Columbus Blue Jackets at 2 p.m. CT at Bridgestone Arena (102.9 The Buzz). The team then commences its “March” to the playoffs with a four-game road trip that will take them through Western Canada with a stop in California before returning home to play 12 of their 15 remaining 2010-11 games at Bridgestone Arena. With playoff hockey right around the corner, the Preds are offering a March to the Playoffs package so fans don’t have to miss a minute of the action. This special package provides fans four games for the price of three, a parking pass for each game and priority to purchase playoff tickets before the general public. Tickets for all home games are still available and may be purchased at the Bridgestone Arena box office, by calling (615) 770-7800 or online at nashvillepredators.com. 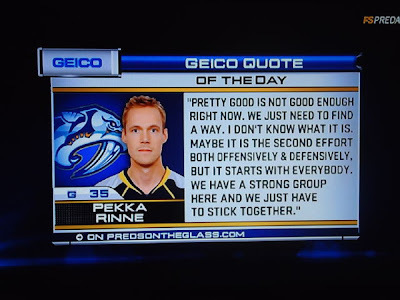 For using our post game quote from Thursday as the GEICO Quote of the Day during the Predators-Stars game today. Thanks also to Ryan Porth for the screen shot. When you are on a losing streak you will never get the breaks or the calls and that proved true again on Saturday when the Dallas Stars beat the Nashville Predators 3-2 at American Airlines Center. Dallas came back from a 2-1 deficit with two goals in the final period to win their second game in a row after a five game losing streak. The Stars got goals from Tom Wandell, Alex Goligoski, and Loui Eriksson while the Preds got markers from Ryan Suter and Colin Wilson. Kari Lehtonen stopped 25 of 27 Predator shots to claim the win while Pekka Rinne was the hard luck loser allowing three goals on 25 Stars' shots. The opening period was like so many that the Preds have seen recently with plenty of wide open play and questionable defense at times. Wandell opened the scoring on a two on one breakaway at 18:06 after a turnover at the end of a Preds' man advantage to give the Stars a 2-0 lead. The Predators led the shot count in the first 12-11 and the Corsi 24-21. Dallas had more scoring chances than the Preds but Rinne made several key saves to keep the game close. The Predators had a better second period with a pair of goals off of rebounds in the dirty area in front of the net. AT 5:00, Suter got his first goal in 27 games of a rebound from a David Legwand shot. Wilson got a goal off of another Legwand shot rebound at 13:32 when he made a play that left him sprawled out on the ice and put the Preds ahead 2-1 to end the period. In the middle period, the Predators out shot Dallas 8-5 and led the Corsi 24-14 and did a much better job of controlling the flow of the game. The Predators got an unfortunate break in the third period at 6:02 when Goligoski flipped a wrister from the blue line that glanced off Jon Blum and then took an odd bounce off the ice and jumped past a startled Rinne to tie the game 2-2. After a boarding penalty on Shea Weber at 15:12, Dallas made a great play on the rush after a botched Predator short-handed rush. Goligoski fired an easy shot wide of the net that Eriksson redirected into the net at 16:18 for the game-winning goal in a Dallas a 3-2 victory. Barry Trotz called a time out with a minute left in the game and the Preds played with an extra skater and even drew a penalty with eight seconds left but could not score in spite of a feverish effort. In the final period, Dallas out shot Nashville 9-7 and led the Corsi 19-16. Blake Geoffrion made his NHL debut and saw limited duty, skating nine shifts in 5:14 minutes of play. He was 0-3 in the face off circle and was officially credited with a take away and had a shot blocked. Matt Halischuk played less than Geoffrion with seven shifts and 4:20 of action in his first game back with Nashville. The loss extends the Predators current losing streak to four games as they remain in tenth place in the Western Conference with 70 points. The Predators returned home immediately after the game and will face the Columbus Blue Jackets at 2 p.m. on Sunday at the Bridgestone Arena. The Jackets are two points behind the Preds and could move past Nashville with a regulation win. The Nashville Predators (31-22-8) are in Dallas today for an early afternoon game with the Stars (32-23-6). Both have 70 points and are in ninth and tenth place in the Western Conference. Neither team is playing well with Dallas going 2-7-1 in their last ten and the Preds going 4-5-1 which includes the current three game losing streak. The Preds and Stars have met twice this season. On October 23, the Preds won 1-0 in Dallas when the team was still undefeated. On December 28 the Preds stunk up the Bridgestone Arena in a 4-2 loss. With all the roster changes that the Preds made in the last couple of days, it will be a new look team on the ice for the Preds which couldn't hurt at this point. Gone are Marek Svatos, Wade Belak, Alexander Sulzer, and Steve Sullivan. Blake Geoffrion will become the first Tennessean in the NHL and the first fourth generation NHLer to play when his skate touches the ice in Dallas. Matt Halischuk will return to the Preds also after playing eleven games earlier this season. Kari Lehtonen (24-18-6, 2.62, .918) will be in net for the stars while Pekka Rinne (21-17-6, 2.14, .928) will go again for Nashville. Just who are the Predators? Are they the team that played a flawless game against Vancouver nine days ago or the no show squad that played in Columbus on Tuesday. Maybe we will get some answers today as to which Predator team we will see for the final 21 games of the season. The Preds head home after the game for a 2 p.m. game against Columbus tomorrow at Bridgestone Arena. A pair of losses this weekend and the Preds could go from desperate buyers needing to overpay for marginal talent to possible sellers to other more desperate teams. The next fifty hours should be interesting. Other previews come from Predlines, Chris Burton, The Tennessean and Predators.com. Josh Cooper spoke with Blake Geoffrion and also has notes from the crazy day in Predland yesterday. Bryan Mullen discusses the Predators feeling the playoff pressure. NHL.com confirms that Blake Geoffrion is the first fourth generation NHLer. David Singleton asks "What the Hell?" in his Friday Face-off. Mark Willoughby has a scary picture from a gas station in his weekly "My View." The Milwaukee Admirals struggled for offense with out Blake Geoffrion and Matt Halischuk in losing 2-1 to Chicago. Rachel from What the Puck has a hockey themed scene from The Office. Adrian Dater's expose on Eklund at Sports Illustrated raised a ton of venom on Twitter yesterday afternoon. I thought that it was well done and fairly balanced whether you like Eklund or not. Ryan Porth has five things to watch over trade deadline weekend as well as his trophy tracker. We hashed over the trophies Thursday waiting out the rain and it is a solid list. Matt Calvert had a natural hat trick in route to a 5-3 Columbus win over Phoenix. Nick Cotsonika looks at the reasons for all the early trade frenzy this year. The Wall Street Journal looks at NHL millionaires stashed in the minors. Our friend (and editor at Inside Hockey) Tim Rosenthal, celebrates his 25th birthday with 25 items. Happy Birthday Tim. It never seems to end in Phoenix as the Goldwater group appears to be holding up the bond sale with a threat of a lawsuit. Scott Burnside has more on the looming ramifications of the slow sale. Mike Modano is expected to return in the Wings game at Buffalo tonight. The power of Twitter strikes again as James Mirtle tells the story of Joffrey Lupol's quest to retrieve a lost cell phone. For Motorola Android geeks, here is a new little widget that is free and give battery life in a true percentage figure and not just in blocks of 10%. Chris Brogan has his latest version of Social Media Etiquette. Here is a piece on how journalist use metrics to track who is reading what. In somewhat of a surprise move, the call-ups that were deemed necessary by all of the day's prior activity by the Nashville Predators are none other than Brentwood's own Blake Geoffrion as well as Matt Halischuk who played 11 games with the Preds earlier this season. When his skate first touches the ice, Geoffrion will become the first Tennessean to play in the National Hockey League. He is expected to make his NHL debut in Dallas on Saturday night against the Stars. His first home game could be Sunday against Columbus. It is somewhat surprising that the Preds would recall an untested rookie over Chris Mueller who performed well in stints in Nashville earlier this year. Since it is doubtful that the Predators would head into the playoffs with a unseasoned player like Geoffrion centering a line, it lends further credence to David Poile being active over the next 72 hours trying to land a veteran center and possibly another forward or defenseman. Nashville, Tenn. (February 25, 2011) – Nashville Predators President of Hockey Operations/General Manager David Poile announced today that the club has recalled forwards Blake Geoffrion (BLAYK JEHF-ree-ohn) and Matt Halischuk (mat HUH-lihs-chuhk) from Milwaukee (AHL). Geoffrion, 23 (2/3/88), is the first Tennessee native to be selected in the NHL Entry Draft (56th overall, second round, in 2006) and this is his first career recall. He ranks second on the Admirals in points (11g-26a-37pts, 45gp) and earlier this month became the first AHLer in 16 years to be named League Player of the Week in back-to-back weeks. The Brentwood native will become the first-ever fourth generation NHLer, following in the footsteps of Hockey Hall-of-Fame grandfather, Bernie “Boom Boom” Geoffrion and great grandfather, Howie Morenz (a part of the Hall of Fame’s first induction class) and father, Danny, who was drafted eighth overall by the Canadiens in the 1978 Draft, and played for both Montreal and Winnipeg during his NHL career, as well as Quebec in the World Hockey Association. The University of Wisconsin product is in his first professional season after winning the 2010 Hobey Baker Award as college hockey’s most outstanding player last spring. Halischuk, 22 (6/1/88), has played 11 games for Nashville this season – all since making his club debut on Jan. 16 at Chicago – posting three points (1g-2a) and a +1 rating while averaging 9:46 per game. The Toronto, Ont., native, acquired from New Jersey in the offseason, also has 23 points (11g-12a) in 37 games for the Admirals, including four (2g-2a) in his last three outings. With just two games remaining in February, in Dallas tomorrow at 1 p.m. (FOX Sports Tennessee, 102.9 The Buzz) and at home on Sunday against the Columbus Blue Jackets (2 p.m., 102.9 The Buzz) the Predators will begin their “March” to the playoffs with a four-game road trip that will take them through Western Canada and make a stop in California before returning home to play 12 of their 15 remaining 2010-11 games at Bridgestone Arena. With playoff hockey right around the corner, the Preds are offering a March to the Playoffs package so fans don’t have to miss a minute of the action. This special package provides fans four games for the price of three, a parking pass for each game and priority to purchase playoff tickets before the general public. Tickets for all home games are still available and may be purchased at the Bridgestone Arena box office, by calling (615) 770-7800 or online at nashvillepredators.com. After last night's tough 3-0 loss to Chicago, the Nashville Predators are not sitting idly by. With the trade deadline looming and obvious needs glaring at David Poile the Preds appear to have started what may end up being their most active deadline in the team's history. Many thought that the Mike Fisher acquisition a few weeks ago would be the extent of what the Predators would do at the deadline. Injuries that have cropped up and have not healed appear to have changed all that. Three things happened almost simultaneously today that hint to the need to acquire a few skaters very quickly in order to fill out a full roster for the playoff run. First, a Tweet from Pierre LeBrun we found out that Wade Belak has been placed on waivers by the Preds. In spite of his rare ice time, he has been an integral part of the team. Then, we then heard from the Tennessean's Josh Cooper that Alexander Sulzer had been traded to Florida and that Steve Sullivan was headed to injured reserve, most likely with his ongoing groin problems. With Marek Svatos being picked up on waivers by Ottawa yesterday, that only leaves 11 healthy forwards and six defenseman ready to play in this weekend's back to back games with Dallas and Columbus. None of the bunch on injured reserve appear anywhere close to a return. Most likely, Matt Lombardi, Cal O'Reilly, and Marcel Goc are done for the year. There is no date for Frankie Bouillon and we can only assume that Sully is "day to day". Therefore, the Predators will probably reach to Milwaukee once again for another forward. I expect to see a recall Matt Halischuk or Chris Mullen this afternoon as both performed admirably earlier this year in Nashville. Longer term, that is probably not the answer for the Predators stretch run so I expect to see David Poile go searching for rabbits to pull out of his hat in the next 72 hours. The quick two game emergence of Jon Blum as a viable NHLer made Sulzer expendable. He also will be a free agent at the end of the year and has a one way contract further adding to the case of him being traded. Nashville, Tenn. (February 25, 2011) – Nashville Predators President of Hockey Operations/General Manager David Poile announced today that the club has acquired a conditional seventh-round pick in the 2012 Entry Draft in exchange for defenseman Alexander Sulzer. Nashville will receive the seventh-round pick if Sulzer appears on the Florida’s Reserve List during the 2011-12 season. Sulzer is one of a franchise-record 18 Predators draftees to appear for the club this season, posting four points (1g-3a) in 31 games. He was selected 92nd overall (third round) in the 2003 Entry Draft. With just two games remaining in February, the Predators begin their “March” to the playoffs with a four-game road trip that will take them through Western Canada and make a stop in California before returning home to play 12 of their final 15 2010-11 games at Bridgestone Arena. With playoff hockey right around the corner, the Preds are offering a March to the Playoffs package so fans don’t have to miss a minute of the action. This special package provides fans four games for the price of three, a parking pass for each game and priority to purchase playoff tickets before the general public. Tickets for all home games are still available and may be purchased at the Bridgestone Arena box office, by calling (615) 770-PUCK (7825) or online at nashvillepredators.com. Last night's Predator loss to the Blackhawks was frustrating for all involved. The players, coaches, and fans all left the Bridgestone Arena wondering what the team needs to to to get back on the winning track. The Preds have lost three in a row and have not scored in the last two games. Barry Trotz was shaking his head, "Every time we've had a little bit of a downturn, it's because we haven't been able to finish. A lot of guys competed really hard in a lot of areas. In the face off circle, we were really strong. We finished checks and went to the net hard. We had chances but couldn't find them." The Predators have found themselves in a position where the breaks are not going their way and are in dire need of something to jump start them and get the pucks going in the goal again. They threw 67 pucks at the net and never found the net. Barry Trotz summed up where the Predators are, "Tonight was an important game. The funny thing is, the next game is going to be more important, and the game after that is going to be even more important." The Preds travel to Dallas today and will play the Stars at 1 p.m. tomorrow before returning home for a 2 p.m. Sunday game with Columbus. Jim Diamond highlights the play of Jon Blum in his home debut with the Preds. From the blog world reports come from Ryan Porth, Amanda DiPaolo, Mark Willoughby, Chris Burton (with his advances stats), and Hockey Night in Nashville. From the Windy City comes the winning story from Second City Hockey, The Sun Times, The Daily Herald, and the Chicago Tribune. 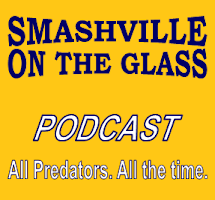 Audio clips from the Predators include Jerred Smithson, Colin Wilson, Mike Fisher and Shea Weber. From Chicago come Joel Quenneville and Duncan Keith. The Space Shuttle Discovery made it safely into space yesterday but Pekka Rinne's jersey did not make the scheduled trip. Jim Diamond has been following the story. Chris Link makes a couple of very valid points at Puck and Punk. I especially agree about forcing the standing O during TV time outs just for the sake of doing it. I think it is losing it's effect already. The Milwaukee Admirals has Chris Mueller's Rags to Riches story. View From My Seats gets around to the Central Division Trade Deadline Roundtable and AJ gives the Preds' view. Rita Mingo at Fanhouse looks at the Predators at the Trade Deadline. As part of the season ticket renewal package, the Predators confirmed a new jersey for next year. As has been bantered about, Alex Kovalev did get traded to the Pens for a bargain basement sixth or seventh rounder. In another deal, the Thrashers traded Brent Sopel and Nigel Dawes to the Habs for Ben Maxwell and a fourth round pick. Carolina was reunited with Cory Stillman after they sent a fifth rounder and Ryan Carter to the Panthers. Another ex-Pred Dan Ellis (and I assume his butler) was traded to Anaheim since the Ducks are sliding with Jonas Hiller being dizzy. Ryan Porth re-looks at the current standings with the Olympic point system. Launy "The" Schwartz from Hockey 54 has is first of many videos to come from the Heritage Classic with new sponsor Booster Juice Canada on board. Ex-Pred Dam Hamhuis is reconsidering his career in light of his third concussion. Kevin Allen is keeping a column updated as major trades occur with his analysis. Steve Lapore has the plans for TSN's TradeCenter show which will give wall to wall coverage on Monday with thirty on air folks. Finally, for the second time this season UK hockey makes headlines with another big brawl. Check out the video. Kelly Slater is giving no hints as to whether he will surf a full season and seek his 11th world title as he is in Australia to surf the season opening ASP event. Droid Life unboxes a Motorola Xoom. It's as close to holding it in your hand as you will see. It's King Cake season from now until Fat Tuesday on March 8. We still waiting for someone to send us one. Hint, Hint! The Nashville Predators appeared ready to match up with the Chicago Blackhawks on Thursday night but fell 3-0 at the Bridgestone Arena in front of a sellout crowd of 17,113. The Predators played a solid game but did not have the ice tilted in their direction. "We had some chances but couldn't find them, " explained Barry Trotz. "There were loose pucks every period that we couldn't get a handle on." Goals by Tomas Kokecky, Marion Hossa, and an empty netter by Patrick Sharp were all it took for the Hawks to get past the Preds. Cory Crawford stopped all 31 Nashville shots, earning his third shutout of the season. Pekka Rinne was good enough to win on most nights stopping 22 of 24 Blackhawk shots. With the win, the Hawks moved into the top eight in the Western Conference playoff race. The loss pushed the Preds into ninth, and out of a playoff position for the first time since January 4. At the end of the game there was six teams with 70 points including the Hawks and the Preds and were spread between fifth and tenth. As the game started, the Predators came out skating with more purpose and intensity and appeared to have recovered from the third period meltdown on Tuesday. The Hawks managed to take advantage of a Predator defensive breakdown at 17:12 when Kopecky skated into the slot off of the bench on a delayed penalty call. He received the puck from Patrick Shark and put it through the Pred defenders to give Chicago a 1-0 lead. In spite of the score, the Predators clearly out worked the Hawks during the opening period out shooting then 10-7 but having a wide disparity in the Corsi 23-11. The Hawks looked like they had scored again at 1:25 into the second period when Ryan Johnson crashed the net and plowed over Rinne. The puck appeared to have trickled into the net but was disallowed on review. The third period started with a another defensive breakdown for the Preds at 2:35 when Hossa was able to steal the puck off off a weak pass and get free on a breakaway and put the puck past Rinne to put the Hawks up 2-0. With 5:59 left in the game Colin Wilson appeared to have scored for the Predators but the goal was immediately blown off for illegal contact with the goalie. The icing on the cake for Chicago was an empty net goal by Sharp with 31 seconds remaining to end the game 3-0. The Predators never gave up in the final period, out shooting the Hawks 12-8 and leading the Corsi 27-14. The loss was particularly frustrating for the Predators as it was the best effort that they have had in a week. "I'm looking at the game and you are not happy with a loss," explained Barry Trotz. "I'm looking at our team and there is; A - a good effort, and B - we had that Predator mentality." "We've got to find a way to win some hockey games. We've got to give some support to Pekka. He can't shut out everybody, every night." Rinne was disappointed after the game, "We played well and had some some scoring chances but you have to give credit to them. It's a good team right there." He continued, "Pretty good is not enough right now. We just need to find a way. I don't know what it is. Maybe it is the second effort both offensively and defensively, but it starts with everybody. We have a strong group here and we just have to stick together." Jon Blum played his second consecutive strong game and appears to be in a position to play he way off of the blue line. "There's no way I wouldn't play him if he continues to play like that," said Trotz after the game. Jerred Smithson summed it up well, "They're a lot of good hockey teams out there out there who are battling just like we are. It's going to take everyone's A-game every single night and we've just got to get it done." The schedule does not get any easier for the Predators as they will leave on Friday to go to Dallas where they will play the Stars in a 1 p.m. matinee on Saturday before returning home for a special 2 p.m. start against the Blue Jackets on Sunday. A couple of personnel notes on the Nashville Predators this morning would lead one to believe that David Poile will be shuffling players either within the system or via the trade route over the next few days before Monday's trad deadline. It was reported by numerous sources that the Ottawa Senators had claimed Marek Svatos on waivers after playing only nine games with the Preds and scoring a goal and adding two assists. A more troubling note came from a Josh Cooper Tweet that said "Marcel Goc out for the rest of the season with a shoulder injury. Surgery required #preds." While the Mike Fisher acquisition was equated to replacing Matt Lombardi, this latest news puts the Predators even further behind the eight-ball. I guess we should expect to see more activity over the next few days. The Nashville Predators (31-21-8) are coming off one of the most horrendous periods of hockey of the season at Columbus on Tuesday to face the defending World Champion Chicago Blackhawks (31-23-6) at the Bridgestone Arena tonight at 7 p.m. While a win in tonight's game is critical to staying in the top eight in the West, the Preds also need to do something to jump start the team and move in a positive direction after two very poor outings against Columbus and Phoenix. It has now been a calendar week since the team looked very inspired on the ice for more than a few shifts. The Preds are expected to have Ryan Suter and Sergei Kostitsyn back in the line up after each missed Tuesday's game due to injuries suffered in last Saturday's game with Phoenix. Barry Trotz also indicated that Jon Blum could remain in the line up as he was pleased with Tuesday's performance. The Blackhawks expect to have Head Coach Joel Quenneville back on the bench tonight after he has been out for over a week when he was hospitalized with a bleeding ulcer. Tonight's game will be the last of the Predators and Hawks six game season series. The Predators currently have a 3-2 lead in games this year. Nashville won 3-2 on October 13, 4-3 on November 13 in a shoot out, and 3-2 on January 15 also in a shoot out. Chicago won 4-1 on December 22 and 6-3 on January 16. Nashville has been very inconsistent since the All-Star break going 4-4-2, mixing exceptionable efforts and real groaners in the process. The Hawks have been a bit better going 5-3-2 during the same period. Heading in to the game, Nashville has 70 points (7th) and Chicago has 68 (9th) as both teams are mired in the Western Conference logjam of seven teams that are within two points and are ranked fifth through eleventh. Pekka Rinne (21-16-6, 2.14, .928) is expected to start in goal for the Predators while potential Calder Trophy candidate Cory Crawford (20-12-3, 2.17, .921) has settled in to the number one goalies slot for the Hawks. After tonight's game, the Predators will face a quick trip to Dallas for a 1 p.m. game on Saturday before they return home for a special 2 p.m. start on Sunday at the Bridgestone Arena. Other Predator previews come from Amanda DiPaolo, Chris Burton, The Tennessean, Hockey Night in Nashville, and Predators.com. From the Windy City comes previews from Second City Hockey, The Sun Times, The Daily Herald, and the Chicago Tribune. Ryan Porth at RLD Radio scored a major coup with TSN's Darren Dreger appearing on yesterday's show during trade deadline week. John Forslund, the voice of the Canes and a regular at Versus was also on. We had a couple of technical glitches in the abbreviated show but it is well worth a listen. Josh Cooper has hints about the message Barry Trotz has been delivering since Tuesday's loss at Columbus. Josh also has a story about Jon Blum wanting to stick in the NHL and a notes column. The Predators put Marek Svatos on waivers yesterday and we should know at 11 a.m. today if he clears or is claimed by another team. No explanation was given but it appears that the Preds are clearing a roster spot for a potential trade or for a returning injured player. Jeremy Gover at Section 303 has his take on the move. David Boclair talked to Steve Sullivan about his frustrations with wearing a mask or a cage. Here is an interesting tidbit from the calendar from @diamondhockey: Preds are scheduled to wear their white jerseys at home tomorrow night. Anders Lindback had a much better game last night in Milwaukee's 6-1 win over Oklahoma CIthy that extended their Western Conference lead to four points. The NHL Examiner takes a look at the Predators at the 60 game mark. Shea Weber is getting plenty of exposure in the area with his picture being featured om Mountain Dew and Orange Crush cans. Each can is worth six dollars off a ticket to a Preds game. Here is Josh Cooper's chat replay from yesterday. Yesterday's Dreger Report indicates that Dallas could have Brad Richards in play. As discussed on yesterday's RLD Radio with Dreger, there are many complications and moving parts on a deal being done. Phoenix's eight game win streak came to an end in Tampa last night in an 8-3 loss highlighted by a Teddy Purcell hat trick. Puck Daddy does yeoman's work in ranking the top 20 all time deadline deals. David Legwand even makes the list. With Jonas Hiller still having dizziness, Ray Emery has been recalled to the Anaheim Ducks. Here are his new mask and pads which are interesting. All parties appear to be in denial but there are indications that the NHL could stream games over YouTube at some point. I was not that excited about the Heritage Classic and even less so after the game turned out to be such a groaner. Since then, I've seen a bunch of on the scene reports like this one that made me reconsider my negativity. Patrick Hoffman interviews our friend Chris Wassel at Kukla's Korner. Ryan Porth is intrigued with he storyline of the Devils making the playoffs. I keep telling him that it will not happen. The NHL wheel of justice spins again with a two game suspension for Scottie Upshall for a hit on Oskars Bartulis. Here is a video of the hit. The Space Shuttle Discovery is slated for its last launch today at 3:50 p.m. Central. Go here for updates and video. So QR codes are finally taking off. Here are tips to use them effectively. Chaco Culture Park celebrated 75 years of weather station data on February 10. It got down to -26 degrees a couple of days after we were there last month. It's gut check time in Nashville for the Predators. Granted, they have been decimated by injuries, but the effort by those who were healthy was not what it needed to be in last night's 4-0, no-show loss to Columbus. While some may want to blame the coaches for the lack of effort, they are not the ones on the ice. In the last couple of weeks we have seen outstanding efforts as well as ones like last night in the third period. A few individual players have been virtually invisible on the ice. Due to the graciousness of those around them, the Predators managed to hang on to sixth place in the Western Conference at 70 points in spite of the loss. With 22 games remaining, it looks like they will need 13 to 15 wins to be in the hunt for at least the final playoff position. The Predators need to rebound tomorrow night against Chicago and play with confidence and play a full sixty minutes. When they travel to Dallas on Saturday, they need to kick the Stars while they are down in the midst of a current five game losing streak and then come home and play with intensity against the Jackets on Sunday afternoon. From the blog world reports come from Amanda DiPaolo, Mark Willoughby, Dirk Hoag (with his advances stats), Jeremy Gover, Predatorial, What the Puck, and Hockey Night in Nashville. Happier stories from last night's game come from the Columbus Dispatch, The Dark Blue Jacket, and The Cannon. Hockey Fights has the Jordin Totoo-Jared Boll tussle. Ryan Porth at RLD Radio has scored a major coup rounding up TSN's Darren Dreger during trade deadline week for his show at noon Central today. John Forslund will also be featured in what should be an outstanding show in spite of my efforts as co-host once again. Be sure and join us live or on podcast after the fact. The Edmonton Journal speculates that last night's game was an audition of Jon Blum's talent for the Oilers' scouts. The Fourth Period finally got around to running Ryan Porth's conversation with Mike Fisher. It was shaky, but Anders Lindback won his AHL debut in a 5-4 Ads victory. Predators.com has their weekly Admirals update. Ryan Porth had a conversation with Shane Doan before the Preds-Yotes game on Saturday. Regardless of the hit on Ryan Suter, Doan is a good guy. RLD Hockey also had a good synopsis of what's left on the schedule for all thirty teams. Steve Lapore has suggestions to improve Hockey Day in America. I love this stuff. Erik Johnson wants payback against the Blues. That is old school hockey. He did score a goal against the Blues in last nights 4-3 Avs win which broke their ten game losing streak. In spite of the Avs breaking the streak, Peter Stastny ripped the Avalanche for making the big trade over the weekend. Predator fans can cheer on ex-Pred Nolan Yonkman who caused Jody Shelly to have 60 stitches during the Coyotes 3-2 win over the Flyers last night. The sale of the Buffalo Sabres to Terry Pegula was finally completed yesterday and he promised to revive the Buffalo scouting department to everyone's delight. How about non-alcoholic beer as a new sports drink. I don't see that this will catch on. If these figures about the value of Facebook posts and Likes and Tweets are correct, I should be rich. Here are a list and discussion of social media measuring tools so you can count your millions from your tweets. Amazon is upping the bar in the online streaming fight with Netflix by offering free streaming of 5000 movies to its Amazon Prime package. The cannon at Nationwide Arena was quiet for two periods but made up for lost ground in the third when the Columbus scored four times and Steve Mason was perfect in net to give the Blue Jackets a 4-0 victory over the Nashville Predators. The Jackets got two goals from Captain Rick Nash and one each from Matt Calvert and Antoine Vermette for far more offense than was needed on a night when the Predators had little offensive punch. Kris Russel and Fedor Tyutin each had a pair of assists and Vermette had an assist for two point nights. Mason stopped all 20 Predator shots in route to his third shut out of the year. Pekka Rinne had little support from his defense as he allowed four goals on 30 Columbus shots. The first period featured plenty of back and forth action with the Jackets out shooting the Predators 13-6 and leading the Corsi 24-13. Both teams were chippy with Nashville leading the hits 16-13. The second period was almost the opposite of the first with the Preds leading the shots 11-4 and the Corsi 17-13. R. J. Umberger had the best chance of the period by either team on a breakaway at 10:00 but was denied by Rinne. The final period was one of the worst of the year for the Predators. The Jackets broke the scoreless tie at 1:11 into the period. Nash took the puck down the left wing all the way from the red line and cut toward the net from the circle and was like a bull in a china shop as he blew past Kevin Klein for the goal. At 4:29, after a Shane O'Brien roughing call, the Preds had a major melt down when Rinne tried to play a puck behind his net but Alexander Sulzer deflected the puck and Calvert grabbed the puck and did a wrap around into an unguarded Nashville net to give the Jackets a 2-0 lead. The wheels came completely off at 9:56 when Vermette was allowed to stand unencumbered in the blue ice where he took a pass from Russel and deflected it into the net to make it 3-0 Jackets. The icing on the cake for Columbus was a beautiful tic-tack-toe power play goal at 19:10 when Nash scored his second goal after perfect passes from Vermette and Jakub Voracek to give the Jackets a 4-0 victory. As poor as the Preds' defense was in the third, the offense matched the effort with the Jackets out shooting Nashville 13-3 and blistering them in the Corsi 21-8. Jonathon Blum had a fairly good first game in the NHL considering how those around him were playing. He skated 19 shifts for a total of 16:02. He had two hits, two blocked shots, and was a minus 1 on the evening. He had no glaring errors during the game. Jordin Tootoo appeared to be more like himself as he squared off with Jared Boll in the closing minutes of the game in a fight where he gave up five inches of height and even more in reach. That should set the stage for some bad blood in the rematch on Sunday in Nashville. The Predators returned home immediately after the game where they will have to regroup before facing the World Champion Chicago Blackhawks on Thursday night at the Bridgestone Arena. As happens so many times, one person's adversity opens up the door for another person's opportunity. Thus is the case with Ryan Suter's injury on Saturday night at the hands of Phoenix's Shane Doan. There has been speculation for two days as to who would get the call to replace Suter and the first indication was with Jonathon Blum being listed in the NHL Game Notes that were released on Monday night. It is now official with the release from the Predators. Blum has played in several preseason games with the Predators but has yet to make his official NHL debut. He was chosen with the 23rd pick in the 2007 NHL Entry Draft. Until this past summer, he was the highest draft pick ever from the state of California. In 54 games this year in Milwaukee Blum has eight goals and 26 assists and is a plus seven. Last season he played 80 games with the Admirals he had 11 goals and 30 assists. Blum played four seasons with the Vancouver Giants in the Western Hockey League and had 204 points in 248 games and 42 points in 67 playoff games and holds the team record for scoring by a defenseman. He was named the WHL Defenseman of the year in 2009 and was a member of the Giants Memorial Cup team in 2007. He also was a member of Team USA at the World Juniors in 2008 and 2009 where he had five points in twelve games. He was team captain in 2009. In a separate Release the Predators announced that they swapped goaltenders with Milwaukee sending Anders Lindback to the Ads and bringing Mark Dekanich to Nashville. Nashville, Tenn. (February 22, 2011) – Nashville Predators President of Hockey Operations/General Manager David Poile announced today that the club has assigned rookie goaltender Anders Lindback (AHN-dehrs LIND-bahck) to Milwaukee (AHL) and recalled goaltender Mark Dekanich (MAHRK DEH-kuh-nihtch) from the Admirals. Dekanich, 24 (5/10/86), will be making his fourth appearance on the Predators roster this season. He spent a week with the team from Oct. 10-17 and made his NHL debut on Dec. 18 vs. Los Angeles during his second recall, stopping 22-of-25 shots in 50 minutes of action. He spent 24 hours on the roster this past weekend, but did not dress for a game. A 2011 AHL All-Star, Dekanich is tied for third in the American League save percentage (.929), ranked fourth in goals-against average (2.04) and is tied for sixth in wins (20). Lindback, 22 (5/3/88), has posted a 10-5-2 record, a .914 save percentage, a 2.58 goals-against average and a pair of shutouts for the Predators in 2010-11, his first season in North America. This is the Gavle, Sweden’s first assignment to the Admirals.